"William Mulholland said, 'There it is. Take it.' Some people think that should be the motto of Los Angeles, but I think it's a little crude. What I love about L.A. is that this is where everybody comes to dream and work. 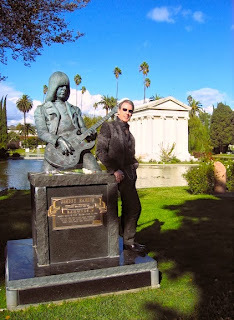 We all have day jobs; we work our asses off," Dance Hall Pimps frontman RJ Comer says as we begin our walk through his favorite place in the city, Hollywood Forever Cemetery. "The people who are here in this amazing cemetery in the shadow of Paramount Studios, they came to Los Angeles to dream and work." Ever since his family migrated from the Midwest (Chicago and Milwaukee) to Simi Valley when he was 14, RJ has been doing just that: working to pursue his musical dreams. In 2009, he formed Dance Hall Pimps as the vocalist/banjoist/guitarist with Jeff Jourard (the Motels) on lead guitar, and the group – that currently includes Vic "Baron" Migenes on drums, Eddie Fish on bass, Steve Carr on saxophone, clarinet and flute, Daniel Alexander on keyboards and Philip Fiorio on trumpet – is poised to release the follow-up to their debut album ( last year's Beast for Love), entitled The Dead Don't Walk, next week (Nov. 5). In spite of being in the midst all the preparations for the record's unveiling and release show happening Nov. 2 at the Mint, RJ graciously takes time to give me the best, most detailed tour of a chosen locale that I've been on thus far. Hollywood Forever boasts as rich and colorful a history as many of the personalities who are buried throughout its 62 acres. Founded in 1899 by Isaac Lankershim and Isaac Van Nuys, the cemetery became the final resting place for the likes of philanthropist Griffith J. Griffith (Griffith Park and Griffith Observatory) and L.A. Times founder Harrison Gray Otis and played a big part in the growth of early Hollywood, sharing a wall with Paramount Studios. It was owned by convicted felon/millionaire Jules Roth for a period when it fell into disrepair but was eventually restored and refurbished by Tyler and Brent Cassity when they purchased the property in 1998 and was placed on the National Register of Historic Places. The moment we meet at the front entrance, RJ hands me a map and begins pointing out landmarks within the cemetery – the Abbey of the Psalms where his favorite jazz saxophonist Art Pepper's crypt is, the dedicated Jewish and Buddhist areas. His excitement is contagious, and we start picking up the pace walking over to his favorite section. "Hollywood Forever is one of my favorite places to come and just chill. What I love about it is, you can come here and just sit. Whether you want to see a mobster [Benjamin "Bugsy" Siegel's crypt is in the Hall of Solomon. ], or if you want to reflect, it's such a beautiful, peaceful place. I especially love it at sundown," he says of the cemetery's park-like atmosphere. "It's a great place to get away from the constant to-do list of living in L.A. and all the administrative duties of being a musician running a band. This place helps me get connected to the creative side and helps me remember why I do this." Growing up, RJ was surrounded by music from his mother (a classically trained singer who performed with big bands, was choir director and played the organ in church), in addition to the folk and bluegrass his ukulele-playing father and banjo-strumming grandfather exposed him to at campfires and sitting on porches. "I was a boy soprano with the red cassock and white surplice in the church choir. One of my first jobs was singing 'Ave Maria' at countless weddings. I also spent about four years in the professional theater, doing musical comedy, singing, acting and dancing on stage. Then my voice changed, and I lost my job. That's tough," he laughs. Living in a house full of all different kinds of music is something that RJ feels he really benefitted from, but he actually found the true musical love of his life on his own. "Little known to my father ( who was not a big fan of the blues) and my mom (who taught me all about Tommy Dorsey, Glenn Miller and the big bands), I fell in love with the blues," he admits. "One of the most memorable performances in my life was when I was little and begged them to stay up late because I heard B.B. King was going to be on 'The Tonight Show.' I remember watching him and saying, 'That's what I want to do.'" We come upon one of the places RJ likes most in the cemetery, the Garden of Legends, and he shows me the grave of Tom Reddin, the Los Angeles Police Department chief when "Dragnet" first aired. Memorials to Cecil B. DeMille, John Huston, Fay Wray, Jayne Mansfield and Hattie McDaniel are located in this area, too. 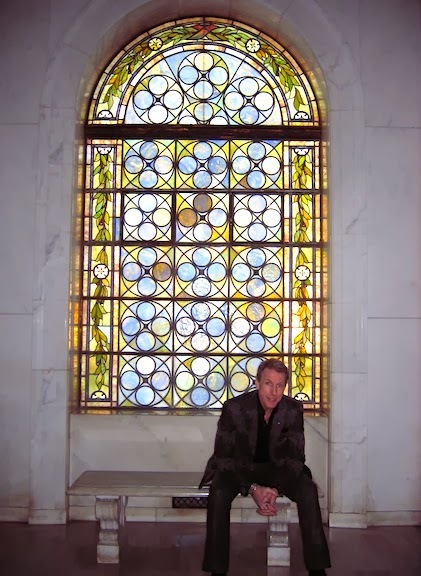 "This is one of my favorite places in the cemetery. I love all these little mausoleums. Being sort of gothic guy, the idea of having a little mausoleum with a creaky iron door and your name on it, that appeals to me," he says with a grin before assuring me that it is OK for us to walk on the grass over graves. "If somebody reaches up and grabs us then…," he laughs. Since Halloween and Día de Los Muertos are just days away, I don't find his comment very funny. Hollywood Forever hosts one of the city's biggest Day of the Dead events every year, which RJ finds great delight in dressing up for. "What I love about the celebration here is that the suggested attire is 'mourning attire,' so I get to wear my cutaway coat, double breasted vest, ascot and top hat," he smiles. We walk over a bridge to the Lake Island Mausoleum erected by William Andrews Clark, Jr., the founder of Los Angeles Philharmonic, and RJ takes a little stroll down memory lane. "Inside there are several internments with Italian mosaic tiles. When I first came here and met the guys who run Hollywood Forever, someone in the group had been a deacon in the Catholic Church and had learned to sing Gregorian chants like I used to sing. We went inside, closed the doors, lit candles and he sang, 'Ubi caritas et amor, Deus ibi est,' which is Latin for 'Where there is charity and love, there is God.' It was so beautiful," he remembers. "I also met Eric Garcetti, who was the council member of this district for so long and is now the mayor, on these steps. He was having an event when he was running for council for the first time, and this is right where I met him." Ramones bassist Dee Dee Ramone is buried on the northwest side of the lake, and to the southwest is a statue memorializing the band's guitarist, Johnny, which is our next stop. The ax man's wife holds an annual Johnny Ramone Tribute cancer benefit at the cemetery, and it's also the site where RJ got his first taste of the legendary foursome's live performances. "We were here when they projected Rock 'n' Roll High School against the mausoleum wall, and they played footage from the Ramones' London New Year's Eve concert for the first time ever. It was really cool because I had never seen the Ramones in concert. They played every song at 90-million miles an hour, every song was less than two minutes and they never took a break," he says in amazement. Hollywood Forever frequently screens films when it hosts the popular Cinespia film series every summer. Old horror movies, film noir and Bob Fosse musicals are responsible for a lot of inspiration in RJ's songwriting, and while we pass the resting place of movie legends Douglas Fairbanks and Douglas Fairbanks, Jr., we discuss the expansion of the Dance Hall Pimps' sound to include horns and harmonica on the new album. "When we don't have horns, we have harmonica [on The Dead Don't Walk]. It's something I always envisioned. When the band first started we had a keyboard player who was also a trumpet player, so he would cross the stage to play either instrument. It was great, but I really wanted a dedicated horn section and a keyboard player. On this record, that's what we did, and now it's what the band is – we have a trumpet/saxophone player and a keyboard player. I would love to have a trombone player because I'm an old-school guy. " This is a statement that RJ repeats several times as we venture into the Cathedral Mausoleum where the crypts of Rudolph Valentino, Harvey Henderson Wilcox and Peter Lorre can be found. 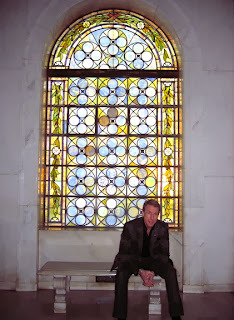 "The stained glass windows on each end of the mausoleum are Tiffany stained glass. It's a breathtaking place," RJ tells. "My home has a lot of stained glass in it as well. I have a 1909 California bungalow that has a huge stained-glass door, and there's stained glass in my study. I guess I'm just an old-school guy, what can I say? That's why I love this place." He further demonstrates his old-school flair when listing some of his other favorite places in Los Angeles: the Roosevelt, Musso & Frank, the fountain at Dorothy Chandler Pavilion. Nowhere is the confluence of all RJ's influences from past eras more evident than in the songs he creates with Dance Hall Pimps. From cabaret and blues rock to Americana and surf rock, the group bends genres into a sound that is all their own. "We don't do the cabaret thing much anymore, that's where we started. Now we've settled into where my roots are: blues and blues rock. I wish there was a real market for cabaret because I love it, but in today's music world the money is in music licensing and publishing. Cabaret doesn't have legs from a commercial standpoint, but I do love the theatricality of it. You think about what covers we have done – Screamin' Jay Hawkins, Lou Reed, David Bowie – we're obviously into theater," RJ states with a laugh. "On the first record, we had 'I Put a Spell on You and 'Walk on the Wild Side. This record we have [Creedence Clearwater Revival's] 'Bootleg,' which was an accident frankly, and 'Sorrow' which wasn't an accident at all. I've always wanted to do something by Bowie." Interesting cover songs aren't the only thing that the two Dance Hall Pimps albums have in common. Their covers both display an image of a werewolf. "The first album cover was done by James O'Barr, who created The Crow, and the record was very much centered in the horror genre where we came from (cabaret, "The Rocky Horror Show"). We're getting away from that on this new record, but it's not a complete departure. So we have the monster, but he's just a shadow. He's behind the man, whereas with the first record he was the subject," he explains. "What we're trying to convey is that there's always going to be a little darkness, a bit of playful, dark horror in what we do. That's why it's in a shadow against the wall. When you listen to tracks like 'Voodoo Bar' and 'Population 100,' they're like the cabaret of Dance Hall Pimps' first record, but when you listen to the first few tracks they're all straight love songs with a dark, macho twist." There is no doubt that The Dead Don't Walk's first five numbers are just that, straight-up love songs with a macho twist. Opener "A Safe Place to Land" is a heartfelt message to RJ's wife. "Love Ain't Just a Feelin'" calls for love to be shown through action and behavior, not selling your heart short and demanding to be treated well. The title track doesn't refer to zombies but to those relationships you just can't quit easily even though you should, while the fifth, "No Survivors," has lyrics inspired by "Sons of Anarchy." "I went to Jeff Jourard to write a song for this record. He comes to me with three riffs, and those three riffs are so powerful that I just decided to write lyrics in between them. At the time, I was powering through all the episodes of 'Sons of Anarchy,' so the lyrics were all tough, slightly demonic motorcycle guy. When we went into the studio to record it, the lyrics were too demonic, so I changed them all at the last second. I wrote the lyrics you hear on the record five minutes before walking into the booth to record because I really wanted to capture a human motorcycle gang, not a demon motorcycle gang," RJ laughs. In all seriousness, The Dead Don't Walk is a major step away from being a cabaret, party band for Dance Hall Pimps. They have crafted personal stories of love and loss into songs anyone can relate to and come back to listen to time and again. There really is something for everyone, as illustrated in the special guests on the album: blues singer and harmonica player Jimmy Wood, hard rock legend Terry Ilous (Great White, XYZ) and, representing metal's new guard, Holy Grail's James-Paul Luna. The album is dedicated to the former talent booker and assistant manager of the Roxy, Jeff Cahill, who passed away earlier this year. "The Roxy was the first venue on the Sunset Strip that got us," RJ says. "We're this band where everybody is over 40, with a weird, eclectic sound that's not traditional for the Sunset Strip. They agreed to give us our first show in the big room on a Monday at 11 p.m. We got 80 people in that room, and they became believers. They booked us ever since, and Jeff gave us our first residency at On the Rox." As an Angeleno, RJ has spent a lot of time on the Sunset Strip and has some amazing memories from shows there. "[I saw] Guns N' Roses play the Roxy before they got signed. Guns N' Roses is one of the greatest bands of all time; their first record is amazing – 'Sweet Child O' Mine,' 'Welcome to the Jungle,'" he says. "When you think of quintessential rock 'n' roll, that's got to be in the time capsule. That, and '(I Can't Get No) Satisfaction.' I never got to see the Stones when they were young, but I got to see Guns N' Roses, Buckcherry and all those great rock bands that tore the Sunset Strip up." Being at Hollywood Forever Cemetery has also stirred up memories from Dance Hall Pimps' shows past, as RJ describes the record release show for Beast for Love that took place on these very grounds. "Our first record release show was here in the masonic lodge in the main building. It's one of the coolest venues in L.A., and it was amazing. The masonic lodge is a beautiful place. The stage is long and not very high, so we built a stage over the stage, a runway. We transformed it into a total rock 'n' roll venue," he recalls. "We had over 350 people here; it was a huge show. There was no way we were going to top that, so we decided not to even try. For [The Dead Don't Walk's release] show we want it close, sweaty and small – like a New Orleans joint." Dance Hall Pimps are sure to have the Mint packed with sweaty, dancing bodies on Nov. 2, and you never know which of The Dead Don't Walk's special guest contributors might take the stage and join the fun. The Dead Don't Walk will be available Nov. 5. Dance Hall Pimps perform Nov. 2 at the Mint. For more information, visit dancehallpimps.com.